Bayern Munich defeated Barcelona 4-0 with a dominant performance. The way both teams approached the game in terms of their passing was interesting and worth some additional analysis. Much of the post-match discussion on TV focussed on Barcelona’s dominance of possession not being reflected in the final scoreline. According to UEFA, Barcelona had 63%, while WhoScored/Opta had it at 66%. However, Bayern were well ahead in terms of shots (15-4 in favour of Bayern, with a 7-1 advantage for on-target shots). It seems that whenever Barcelona lose, their possession statistics are trotted out as a stick to beat them with. Given that Barcelona have gone more than 300 games and close to half a decade since they last played a game with less than 50% possession, I very much doubt there is causality between their possession statistics and match results. Barcelona choose to play this way and it has certainly been successful. However, it is worth remembering that not all teams play the same way and the assumption that there is a single holy grail metric that can ‘explain’ winning football matches is probably a fool’s errand. Even if one does exist, it isn’t a match aggregated possession statistic. In terms of passing, I’ve tried to look more at the process using network analysis to establish how teams pass the ball and which players are the most influential in passing terms in a given match, rather than focussing on a single statistic. Below is the passing network for the match. The positions of the players are loosely based on the formations played by the two teams, although some creative license is employed for clarity. It is important to note that these are fixed positions, which will not always be representative of where a player passed/received the ball. Only the starting eleven is shown as the substitutes had little impact in a passing sense. Passing network for Bayern Munich and Barcelona from the Champions League match at the Allianz Arena on the 23rd April 2013. Only completed passes are shown. Darker and thicker arrows indicate more passes between each player. The player markers are sized according to their passing influence, the larger the marker, the greater their influence. The size and colour of the markers is relative to the players on their own team i.e. they are on different scales for each team. Only the starting eleven is shown. Click on the image for a larger view. As might be expected, the contrast between the two teams is quite clear. Bayern focussed their passing down the flanks, with Ribery and Robben combining well with their respective full-backs. Neuer, Dante and Boateng fed the full-backs well to begin these passing transitions. Barcelona on the other hand engaged in their familiar multitude of passing triangles, although with a bias towards their right flank. 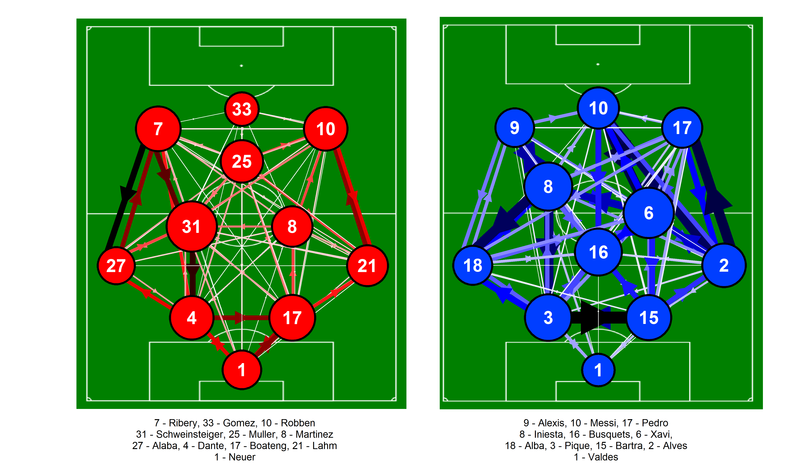 There are a number of strong links although the somewhat uninspiring Bartra-Pique link was the strongest (23 passes). While Barcelona’s passing network showed plenty of combinations in deeper areas, their more attacking players combined much less, with the links between Alexis, Messi and Pedro being relatively weak. In particular, the passes to Messi were low in number as he received just 7 passes combined from Iniesta (3), Pedro (2) and Alexis (2). Messi had much stronger links with Xavi (received 20 passes) and Alves (received 19 passes) although I suspect many of these were in deeper areas. While, Barcelona’s midfield three exerted their usual influence, the next most influential players were Pique and Bartra. This is a stark comparison with the home match against AC Milan, where Messi was the most influential player after the midfield trio. Bayern did a great job of limiting Messi’s influence, although his injury likely contributed also. Schweinsteiger was the most influential player for Bayern, linking well with Dante, Alaba and Ribery. After the centre-backs, Bayern’s next most influential players were Robben and Ribery who counter-attacked superbly, with excellent support from their full-backs. As discussed by Zonal Marking, Bayern preyed on Barcelona’s weakness on the counter-attack with speedy breaks down the flanks. Bayern were incredibly effective and deservedly won the match and very likely the tie.